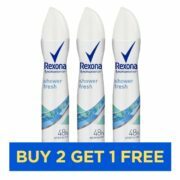 REXONA Antiperspirant Aerosol Deodorant Shower Fresh 150mlStay fresh throughout the day with Shower Fresh 48 hour antiperspirant available in a 150mL aerosol ready-to-go design. Blended with floral fragrances to leave you feeling fresh in a convenient package. 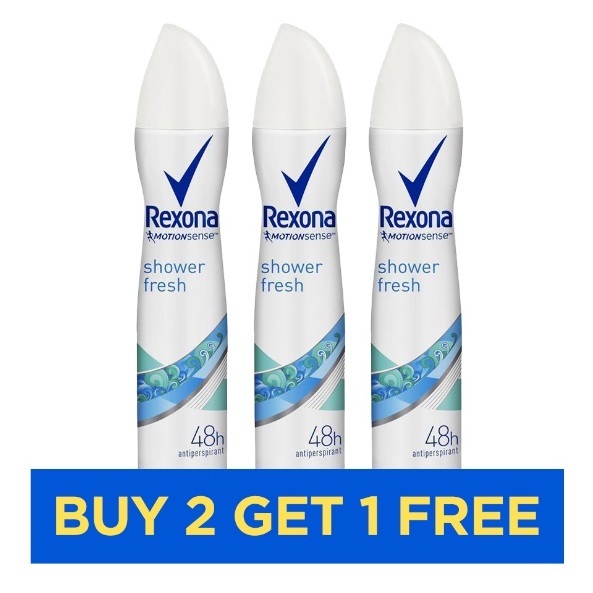 Rexona products are intelligently designed to work as hard as you do. Rexona make it their business to know more about sweat, and what they learn informs every product innovation. Sweat, also known as perspiration, is a normal and healthy bodily function and it starts to occur just a few months after birth. We mainly sweat to cool our bodies down, a process called thermoregulation. Our brain sends a signal to over 3 million glands in our body to release sweat (a clear fluid made of water, salts and proteins). As this fluid evaporates from our skin, it lowers our body temperature.